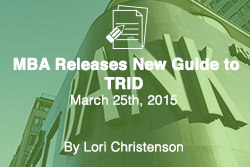 With the TILA/RESPA Integrated Disclosure (TRID) deadline quickly approaching, the Mortgage Bankers Association has release a new resource for those interpreting the 1,888 page rule. The MBA Compliance Essentials TRID Resource Guide provides a summary of the rule, guidance on completing the forms, and model policies and procedures. It also provides a checklist to ensure compliance by the deadline. The guide is written by top compliance experts, Richard Andreano, Jr., a partner at Ballard Spahr LLP and Richard B. Horn, a partner at Dentons. The purpose of the TRID is to provide more useful and clearer information to the consumer and is 17 years in the making. On September 30, 1996, the Economic Growth and Regulatory Paperwork Reduction Act was enacted by Congress to simplify, improve, and unify TILA and RESPA disclosures. Congress directed the Federal Reserve Board and the Department of Housing and Urban Development (HUD) to integrate the TILA and RESPA disclosures on March 14, 2008. After the housing crisis and the passage of the Dodd-Frank Act, rulemaking authority shifted to the CFPB who issued the proposed rules and integrated forms on July 9, 2012. The final rule was issued in November 2013, with additional amendments proposed October 10, 2014 and made final January 20, 2015. The rule combines the Good Faith Estimate and the early Truth-in-Lending Disclosures into the Loan Estimate, and the Settlement Statement and the Final Truth-in-Lending Disclosures into the Closing Disclosure. Compliance with the rule is required for applications received on or after August 1, 2015.